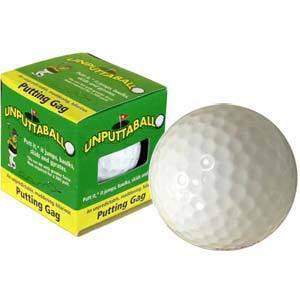 Unputtaball | Your gag golf ball baulks, skids and gyrates! Make putting even more challenging! Your gag ball baulks, skids and gyrates! For most of us, putting is a challenging at the best of times. So just imagine putting with a ball that won't go straight! When putted, the Unputtaball jumps, baulks, skids and gyrates. It is unpredictable, maddening, and hilarious for anyone watching. So pull a swift one on your mate when he's not watching, and swap his ball on the tee. Challenge him to a competition and see who can putt the Unputtaball in the least mount of strokes! 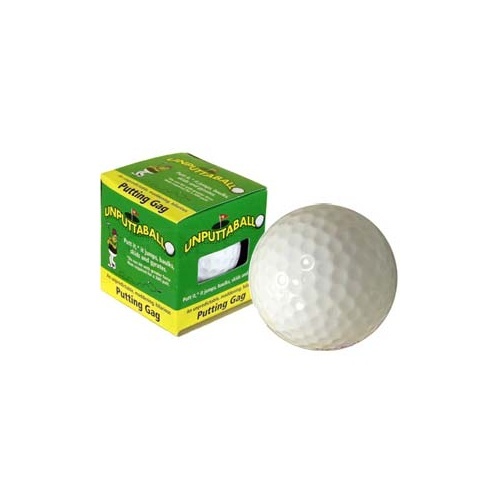 The same size and dimension as a regular golf ball.